A team of students from the UCLA Department of Architecture and Urban Design, under the direction of architect and UCLA SUPRASTUDIO lecturer Julia Koerner, won first place in the American Composites Manufacturers Association's (ACMA) first ever Composites in Architecture Design Challenge. "Undulating Gills," created by students Anna Kudashkina, Yifan Wu, YuekanYu, Shahr Razi, Simi Shenoy and Marcelo Marcos, is on display in ACMA's Composites Pavilion at the American Institute of Architects' 2016 Convention in Philadelphia. The student team will also receive a cash prize. For the challenge, ACMA’s architectural division asked students to work in teams to develop an innovative composite architectural/building component or assembly. The teams were encouraged to explore and invent new, and sometimes radical, architectural designs. The UCLA team worked on the project during Koerner's SUPRASTUDIO technology seminar, "Animated Fibers." "Undulating Gills" incorporated composite fabrication of "mega-panels" while integrating robotic technology to fabricate panels without a mold. 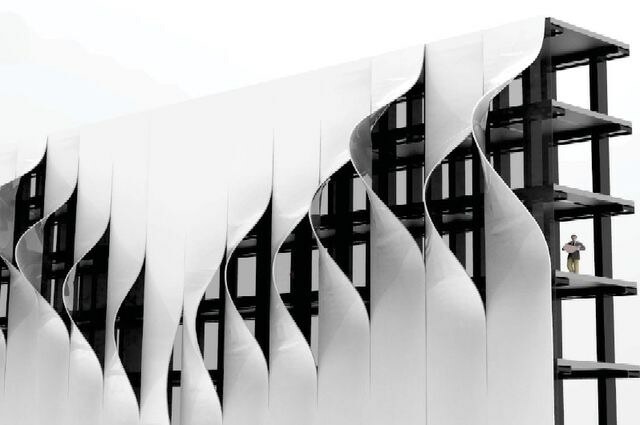 The result was a twisting structure that creates a "parametric relationship between a series of panels to allow for lighting control on a facade." Koerner said that there will be there will be follow-up work to the research. “Currently we have a couple of students working on the documentation of the research and advancing some of the techniques they have explored within an independent study,” Koerner said, adding that she and UCLA architecture professor Greg Lynn will work with students in the future to further explore the integration of composite materials in architecture. Find more information in the ACMA announcement.